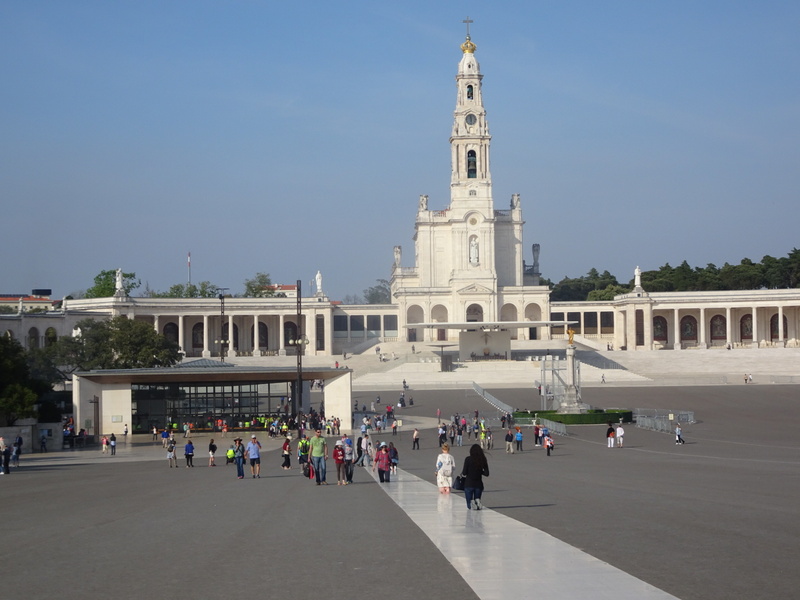 We leave Fatima through the main plaza, passing the long stone path leading to the chapel. A few pilgrims are already there, the beginning of the daily tide, polishing the stone path with their knees as they crawl the last few hundred yards. The faces are a mix. Tears cover some. Smiles spread on others. Thought, awe, joy, and relief find their place. We find the trail south and walk against a growing stream of pilgrims. Big groups in their neon green vests, couples side by side, Camino walkers heading north, they all come, the joy of the end surging through their steps. I watch their faces too. I almost never think of the end, but as their faces pass I think of my own face, what it might wear in those last steps. The end is not so far away now, maybe less than a month. It is almost safe to think about. Lisbon, I tell myself. Lisbon and Cabo do Roca. Cabo do Roca and Faro. Faro and Seville. Seville and then, then when this continent can stretch no farther south, then the end will come. Be in the moment. Be in every step. The rest is a possibility, an illusion. D. Your journey has been so amazing. None of your fans want to see it end but it will just be a new beginning for you. Fyi……just bought a tandem kayak. Come up to MN when your done and we’ll do some more kayaking. There is a town called Santos in Brasil that I spent many years passing through on my way from São Paulo tô Guaruja, and island off the coast of Brasil that we had a summer place on. And Santos is where Pele is from. Fatima is the name of my brother’s wife. All these names remind me of this world I no longer inhabit, but love to be reminded of. Enjoy your time in Portugal, enjoy hearing Portuguese, more Italian sounding than Spanish. Boa sorte, meu amigo. As the pilgrims approach on their knees do those nearby still shout “ultreya”? Not that I saw, but I also wasn’t looking for it so maybe!